More FAQs on GO NeoTack Dye Sub Ink--How Does Tack Work? Does NeoTack actually have tack in the ink? Yes. GO NeoTack’s use of tack is patented and is the only dye sublimation ink to offer this capability. What impact does the tack have on the flowability of the ink? GO NeoTack has been tested for the past twelve months and has completed internal certification for use with the most advanced EPSON printheads. Extensive long term testing ensures the runnability and no clog formulation of the ink. How does the tack work? GO NeoTack employs the use of a chemically inert nano-agent which is heat activated at 140 C when using standard heat presses, calendars or other heat units. Once heat is applied, chemical bonding occurs and the ink adheres to both the fabric and the paper. Does the use of tack totally eliminate the need for tack paper? Not in all cases. With some fabrics there is not enough of fabric pile to create a strong bond. In such cases, we recommend testing to ensure tack paper is not needed. When using GO NeoTack without tack paper, a user can expect to save between 10-25% in paper costs. Can NeoTack be used with tack dye sub paper? Yes. When NeoTack is used with tack dye paper the user will have super tack capabilities. Users have been astounded with the crisp, clean lines and edges provided when using NeoTack with both standard and tack dye sub papers. What is the use of tack paper and is there an extra cost for tack paper? Tack paper is used to eliminate ghosting or “double imaging” from the heating process. Generally tack dye sub paper is between 10-25% more expensive than normal dye sub paper. What type of packaging is offered for GO NeoTack? GO NeoTack is packaged in our InkPack mylar bags and used with our GO bulk ink system. The InkPacks come degassed and eliminate both contaminents and evaporation which occurs with open containers. 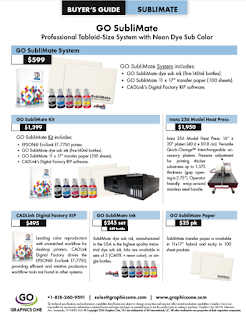 GO’s InkPacks enhance the overall performance of our ink and are normally used with GO’s low cost bulk ink system. What is the list price of GO NeoTack? GO NeoTack’s List Price is $125 per liter and $65 per 500 ml bag. Are the GO NeoTack inks covered by a patent license? Yes. All dye sub inks offered by GO are licensed under U.S. Patent No. 5, 488,907. Does GO offer any special bundles for changing over to GO NeoTack ink? If an 8 color system, please add $310.